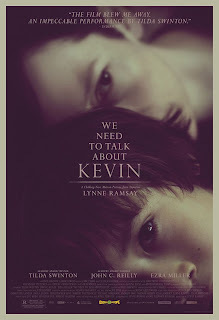 "We Need to Talk About Kevin" is a weird flick. You should be ready, something I wasn't, before watching the film. It appears rather normal in the trailers. A nice, credible cast taking on a genre that doesn't get a whole lot of serious thought. Besides all the festival fodder attached to it I actually expected more of an Omen/Damien kinda feeling in that this kid was evil and we were going to see the results of that. Funny thing about "Kevin" though is he actually doesn't develop much in front of our eyes. No, what we see is his evolution through the eyes of his mother Eva and how from birth there is simply something unsettling about the kid. I have never been a huge fan of Tilda Swinton, I guess I just didn't get it; especially a few years ago when she blew onto the scene and had a part in every awards contender on the block. Since, I haven't heard as much from her but she lives up to the acclaim with this performance. The whole film hinges on what we think of Eva. From the outside she could be viewed as the parent who did all the wrong things, but as we get to experience first hand the pain she endured and will endure for a lifetime we know she is nothing more than a woman that constantly wonders, "why?" In the nearly two hour run time Swinton hardly speaks. It is almost jolting when we do in fact hear her voice but it is also an affect director Lynne Ramsey doesn't take for granted in the script. Instead she uses the combination of Swinton's performance and the slow burning revelation of what exactly Kevin did to entice us by making us want to look away, while knowing it is impossible to do so. Focusing her camera on Swinton's face and guiding us effortlessly through different time frames, Ramsey has concocted a truly terrifying psychological drama that only suffers because for all its great performances and genre bending style, at the end of the film we still don't have an idea of who Kevin is to really continue talking about him. at the hospital for news of their daughter. I have not read the 2003 novel from which this film is based, but after watching the film I can imagine it to be an insightful piece of horror. I wonder whether or not the structure of the book is similar to that of the film because for me, that is the definitive characteristic of this movie. The way in which Ramsey is able to manipulate her audience through different points in Eva's life is flawless and though the default signal is Swinton's hair length, we don't even have to notice that because it is clearly painted all over Eva's face at where she is at in her life. In what could be called flashbacks I guess, it would seem more fitting to refer to them as memories in this case (that's just how the movie makes you feel) we see Eva meet Franklin (a suppressed John C. Reilly) as they form a relationship and create a child. It is with their first born child, the creepily demonic yet calm Kevin, that we begin to understand what we have seen previously in more present versions of Eva. The film covers over fifteen years of Eva's life as she deals with her son and his at times pure hatred towards her. It is both irritating and scarily engaging to watch as Kevin begins as a baby who never stops crying around his mother. We see him grow to what looks like a three or four-year old child who doesn't speak and won't respond to the activities his mother tries to interest him in. 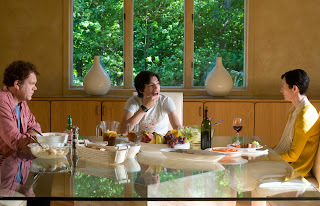 It is here we begin to catch glimpses of a more mature Kevin, as a high-schooler played with no obvious issues but an immediate creepiness by Ezra Miller. As said in the beginning though, we are never as closely linked with the character in the title as we are with his mother. The film is a study of a mother and how she deals with her grief and the feelings of responsibility for what her son did. It is a movie that for most, might be hard to watch, but is certainly worth your time and attention. Kevin (Ezra Miller, center) does something to ruin it. The biggest theme the movie explores, and what I'm sure the basis of the book was, is the oldest debate in psychology: nature vs. nurture. What the film doesn't do is define what side it is taking; though the obvious choice would seem to be that of at least certain traits being inborn. The idea that certain things simply occur naturally regardless of environmental influences. "We Need to Talk About Kevin" certainly doesn't go along with the ideas that we are born as a blank slate and everything that we are, everything we become is determined by our experiences. No, what is in Kevin is an innate evil. Still while I personally think there are aspects of everyones life that are of course influenced by our surroundings I also think that we do have traits that are what you might call genetically predisposed. The movie offers an exploration into this issue by giving us that protagonist's view of Eva. She is a caring, sweet mother. We see that when there is a glimmer of hope in Kevin and in the way she loves and cares for her daughter Celia. Through this perspective we see no reason as to why Kevin turns out the way he does or even why he thinks in the terms he does. He is a completely different person around his father than he is his mother. If anything that proves an intent. We immediately are given the impression Kevin is a smart child, that there is something different though he appears normal in the most average sense of that word. That he does these things with an instinct to hurt others and that we never see him playing a video game or listening to metal supports the idea Kevin was genetically determined to turn out the way he did. What we do see is very little in the way of his father getting him a bow and arrow when he is a young child. To anyone else it would be a toy, a fun hobby, to Kevin it is the answer to all the desires he needed to accomplish. Eva and Kevin's relationship has always been a bit strained. I can understand Ramsey's reasons for not letting us more into the head of Kevin as she was most likely staying as true to the novel as possible, but even in that sense I think at least some chapters might have been more engaging, more eye-opening had we seen the grief, the memories, the reasoning of what is happening through Kevin's own mind. If we could read or visually see his thoughts it would have lent the film a deeper resonance with what happens in the conclusion. Instead we have a film that leaves us as clueless about "why?" as it does our main character. It is the last question, the last piece of dialogue Eva mutters in the film and it is what we have been waiting for the entire movie. What Kevin reveals is nothing short of a let down and thus gives me my only real complaint about the experience. There were certainly slow parts throughout where the change from Eva's memories to those of Kevin's would have benefited the pacing, but again, I understand where Ramsey is coming from and why she chose to stick with her one point of view. 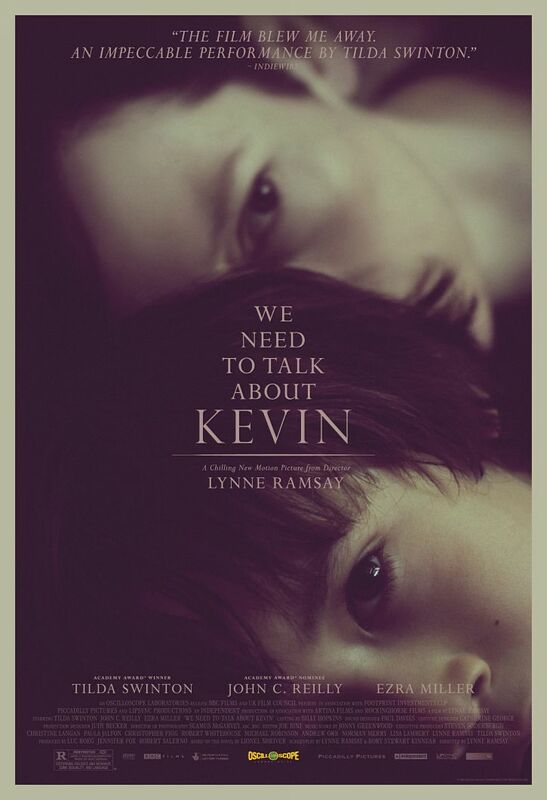 It is still a haunting one, and naturally a more painful interpretation of the events whereas Kevin's would no doubt have been more blunt and heartless. The film overall is generally effective but it is Swinton's performance that catapults it above to something of a higher level. A movie that is not just a piece of entertainment, but a study of a role that more people play than any other in the world. It is completely relatable, completely possible and in that is the most terrifying truth the film brings to the surface.